And while LUNAR’s research-use-only launch may be a relatively small step for a company that has fully launched two successful assays for later-stage cancer, Guardant is planning for a proverbial giant leap in the second half of this year when it rolls out the blood-based cancer test for clinical use. LUNAR will be used by top-tier academic research networks and biopharmas in studies involving adjuvant therapy decision-making, recurrence monitoring, and screening for early-stage cancer. Using a single blood draw, LUNAR is designed to detect early-stage cancer and recurrence of disease through simultaneous detection of both genomic alterations and epigenomic signatures with high clinical sensitivity and specificity. LUNAR—formerly named LUNAR-1—is designed to help clinicians detect cancer recurrence during early stages, when intervention is expected to have a higher chance of success in battling the disease. Guardant also envisions LUNAR as helping its more than 50 biopharma partners identify new opportunities in developing adjuvant drugs and therapies designed to target earlier-stage cancers. LUNAR has been developed using data from the more than 80,000 patient samples collected from users of Guardant’s liquid biopsy-based tests for advanced-stage cancer, Guardant360® and GuardantOMNI. Guardant’s best-funded competitor, Grail, is developing an investigational blood test that uses next-generation sequencing (NGS) technology to detect lung cancer and other cancer types. Grail has announced plans for a 50,000-participant clinical trial designed to assess its assay. Grail has raised $1.5 billion in financing since it was launched in 2016, with backers that included Illumina, Bill Gates, and Jeff Bezos. Simon said Guardant is continuing to develop the second early-cancer LUNAR assay platform, called LUNAR-2, with no timeframe set for its launch. According to the company’s initial public offering prospectus, LUNAR-2 will consist of tests for asymptomatic individuals at a higher risk of developing cancer due to multiple factors, including moderate to heavy smoking, hereditary risk, and pre-existing infections or inflammatory conditions. According to the company, LUNAR can report genomic alterations down to allele frequencies of 0.01%, and effectively filter out biological noise, such as mutations caused by clonal hematopoiesis of indeterminate potential—making the new test an improvement over Guardant360, designed to measures 73 cancer-related genes from circulating tumor DNA (ctDNA). 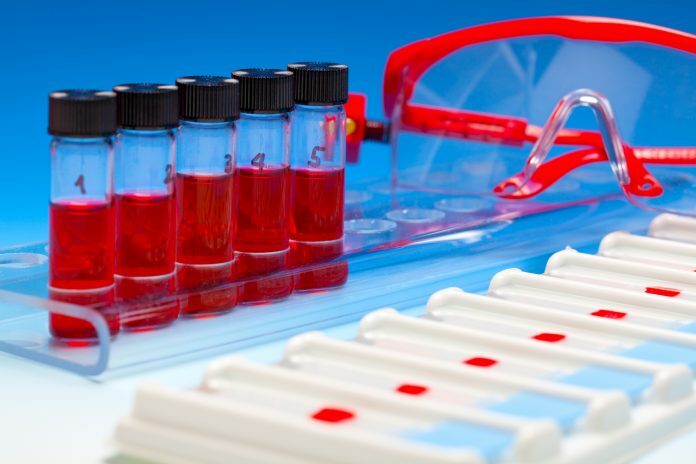 Guardant360 is one of Guardant’s two marketed liquid biopsy tests. Since it was launched in 2014, Guardant360 has been used by more than 6,000 oncologists, more than 50 partner biopharmaceutical companies, and all 27 National Comprehensive Cancer Network (NCCN) Centers. Last month, Guardant agreed to develop and seek FDA approval for a Guardant360 companion diagnostic test for AstraZeneca’s Tagrisso (osimertinib), a third-generation EGFR inhibitor in advanced non-small cell lung cancer (NSCLC). Guardant also agreed to develop a plasma-based tumor mutational burden (TMB) score CDx test using its other marketed test, GuardantOMNI to predict response to AstraZeneca immunotherapy and targeted therapies within its oncology portfolio, including Imfinzi (durvalumab). Guardant raised approximately $249.5 million in net proceeds during its IPO, which closed October 9—more than double the $100 million in gross proceeds the company initially planned. Guardant sold 14,375,000 shares at $19 a share, including 1,875,000 shares reflecting the full exercise by underwriters of their option to purchase additional shares at the IPO price.